[SatNews] ViaSat Inc. (Nasdaq:VSAT) has acquired the SKYLink airborne broadband service from ARINC Inc. and added those business jet customers to the ViaSat Yonder(r) high-speed Internet access network. 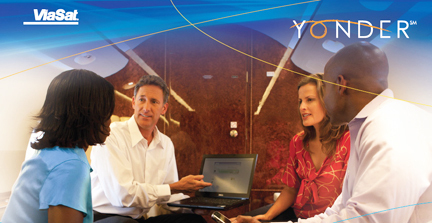 The combination is intended to provide Yonder and SKYLink customers with an enhanced service experience. The acquisition adds about 80 private business jets to the Yonder network and increases the satellite capacity of the network. With the help of its preferred service partner, Satcom Direct, ViaSat has been gradually transitioning the new customers to the Yonder network over the past few months. Yonder service will provide former SKYLink customers with the same high quality service, but with an expanded coverage area. The Yonder high-speed inflight Internet service now encircles the globe, with continuous coverage of virtually all major city pairs worldwide. Yonder service offers cable modem-like performance with individual passengers experiencing data download speeds of 1 to 2 Mbps and upload speeds of 128 to 1024 kbps. Business jet customers get an “office in the sky” experience, with the ability to send and receive high-speed data, connect to a virtual private network, use VoIP equipment for voice calls, and access the Internet using portable devices via an in-cabin Wi-Fi network. 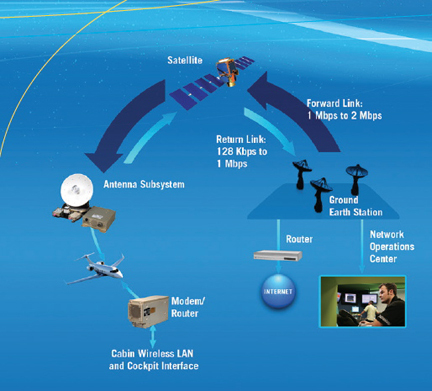 The mobile Ku-band satellite network uses ViaSat technology to provide IP service on a near global basis with seamless switching between satellites. As part of the acquisition, ViaSat also gains access to FAA Supplemental Type Certificates (STCs) held by ARINC for installation of ViaSat Yonder-compatible VMT-1500 Ku-band equipment on Boeing Business Jets, Cessna Citation X, and Challenger 604 aircraft.